I had previously lamented the fact that IndoMie's offerings are only 85g and are rather inadequate, especially with the increased effort of having to open up to 5 flavor packets. So I was happy to find the "Jumbo" version of one of IndoMie's Mi Goreng Rasa Baso Sapi, which comes in at 120g. The translation of the name is "Beef Fried Noodles". 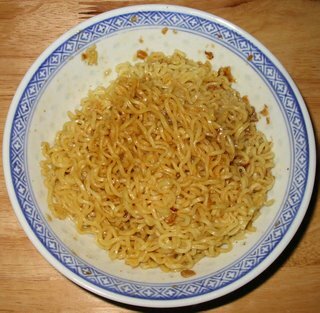 IndoMie's noodles generally have cooking instructions slightly different than typical instant noodles. You are supposed to cook the noodles and dump all the seasoning packets onto a plate. Then, you drain the noodles and transfer them to the plate and mix everything together. It seems like a cool idea to have 5 flavoring packets (seasoning powder, seasoning oil, sweet soy sauce, chili powder, and fried onion), but it turns into a giant pain when it is actually time to open them all, especially since they are attached to each other. 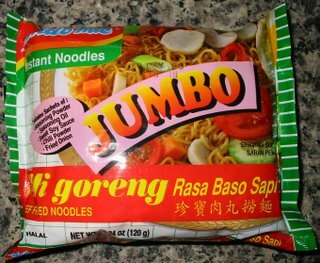 Overall, the taste was quite similar to the IndoMie Mi Goreng that I tried before. The noodles are rather oily and the taste is dominated by the sweet soy sauce and the fried red onion. The flavor is quite good and unique and I'm glad that IndoMie has a reasonable size instead of their tiny 85g package. Ever wonder what happens when you take the spiciness out of instant Korean noodles? That's what I set out to discover when I tried these noodles. Upon opening the package, I was mildly displeased that the noodles didn't resemble Udon noodles at all and were instead the normal noodles that you find in Korean instant noodle packages. 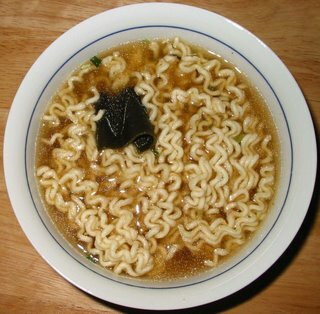 Udon noodles are supposed to be much thicker and chewier, but these were the same noodles you might find in Shin Ramyun. I was also shocked to discover what looked like a piece of burnt and melted plastic. I soon realized that it was just a dried piece of seaweed, though. I've never seen that before in instant noodles and was mildly intrigued by it. Well, this turned out to be a rather bland and uninteresting ramen. There's little flavor to the broth besides salt and MSG. The seaweed turned out to be overly chewy and bad-tasting. 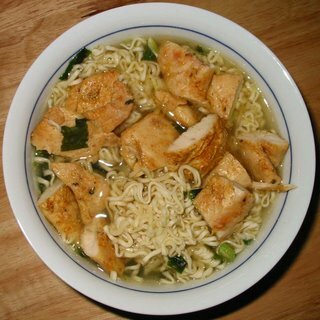 Overall, it was an unremarkable experience which was saved only by the fact that I added chicken to liven things up a bit. 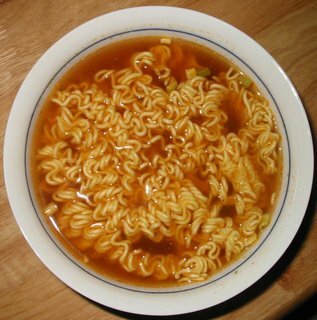 I think the Korean instant noodle soup manufacturers should stick to what they know best: spicy spicy spicy! I'm not sure why I bought this pack of noodles except maybe just pure curiosity. 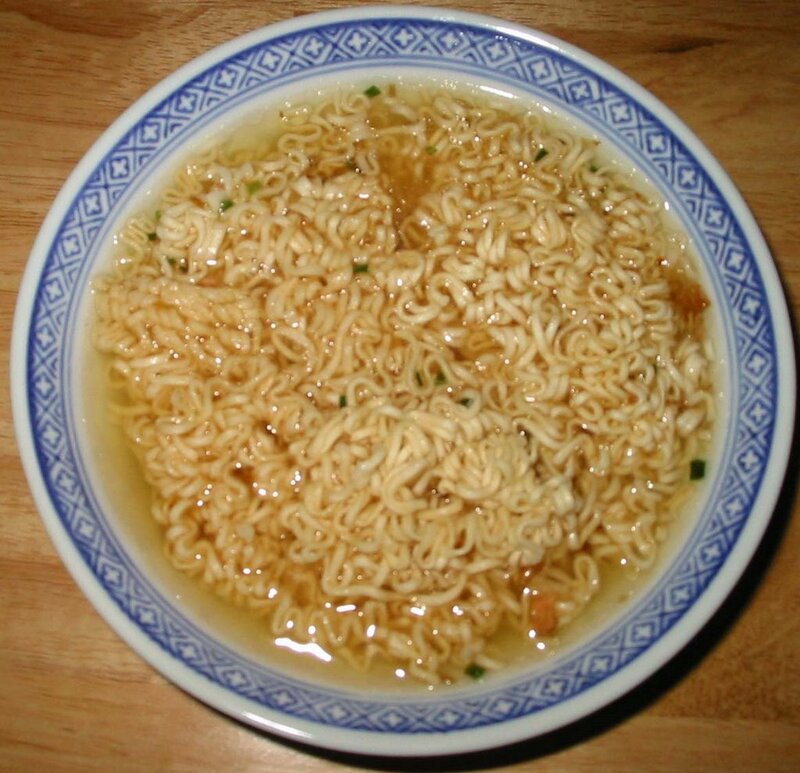 Although I love shrimps, I'm not usually a fan of shrimp in ramen form...because quite frankly, shrimps (unlike chili peppers) do not translate well to a powdered soup flavoring. The name of these noodles was "Furong Shrimp Flavor Noodles". I have no idea what Furong means and a Google search only turned up a Chinese cult-celebrity named Furong Jiejie who is apparently their equivalent William Hung. Maybe those two should get together! Supposedly, Furong refers to a flower that has been used to describe young beauty, but still I don't know how this relates to shrimp or noodles! As you can see, I added some grilled chicken to the mix to add some non-harmful nutritional value to this meal. 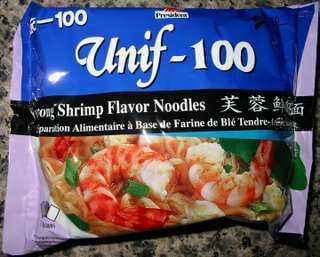 After tasting these noodles, I suspect that "Shrimp Flavor" is something that ramen manufacturers use to describe something that has no real flavor besides salt and a hint of fish paste. In other words, it didn't taste like shrimp at all. Then again, I'm not sure if I would have wanted to eat something that was pervasively shrimpy. I was pleasantly surprised by the high amount of seaweed and scallions, but that couldn't make up for the fact that this stuff didn't have a particularly nice flavor that certainly didn't match what it was advertised as. I had a pretty good idea what this ramen was going to taste like before I opened it. 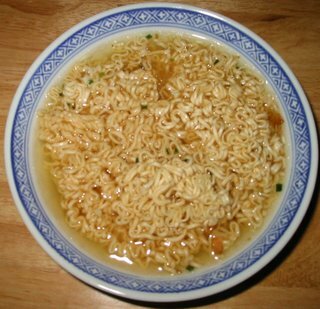 That's because it falls into the category of Korean ramens which tend to share several two characteristics: they are spicy and contain a lot of noodles. Interestingly, this ramen advertised itself as being Kimchi flavored, instead of just Hot & Spicy as usual. Luckily, I consider myself an expert on Kimchi, so I am fully qualified to determine whether or not the flavor is truly Kimchi, or if it is just sneaky false advertising. For those unfamiliar with Kimchi, it is a Korean side dish consisting of spicy fermented cabbage. Sounds kind of gross but it is actually quite good. 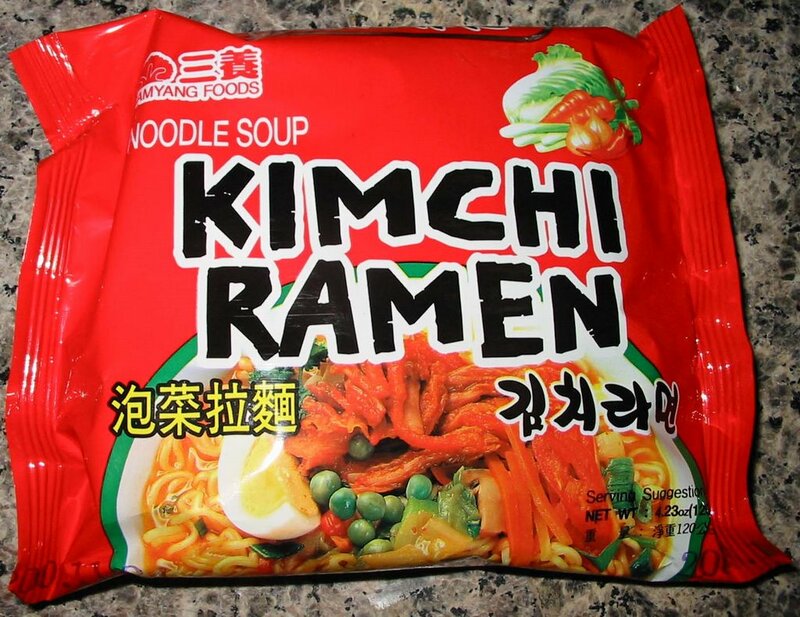 Interesting to see how it would taste in ramen form. Well, it turned out to fall a little short of my lofty expectations. 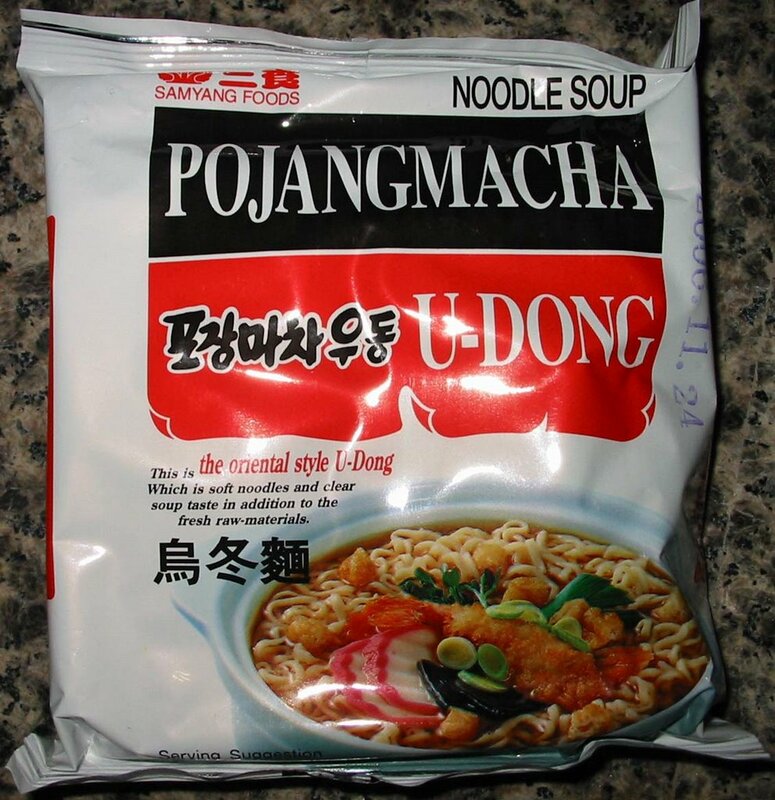 It didn't really have the distinctive tang and bite of real Kimchi. Instead, it seemed just like every other Korean ramen that I have ever had: it was spicy and contained lots of noodles. 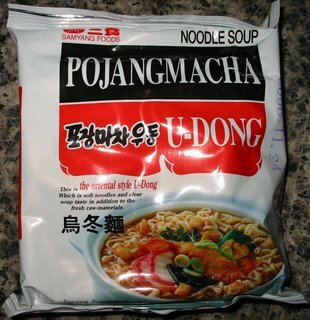 That's just fine with me, since I happen to enjoy Korean noodles. Still a little disappointing that it didn't quite live up to the big Kimchi printed across the front! 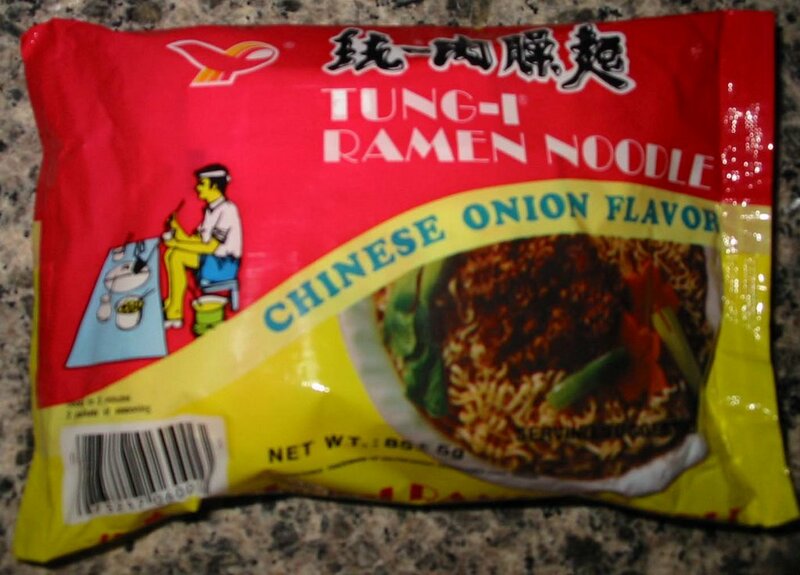 I bought these noodles because I had a faint memory of enjoying them as a child. Chinese onion refers to fried red onions, which are a common ingredient in Chinese cooking and can be used in a similar way to garlic. These noodles were very fragrant after I started cooking them. 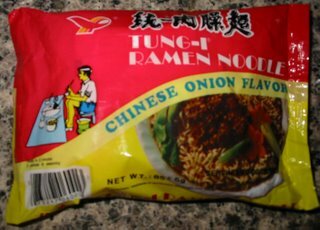 The flavoring basically consists of salt and fried red onion, so you better like the taste of these onions if you are going to be eating this ramen. 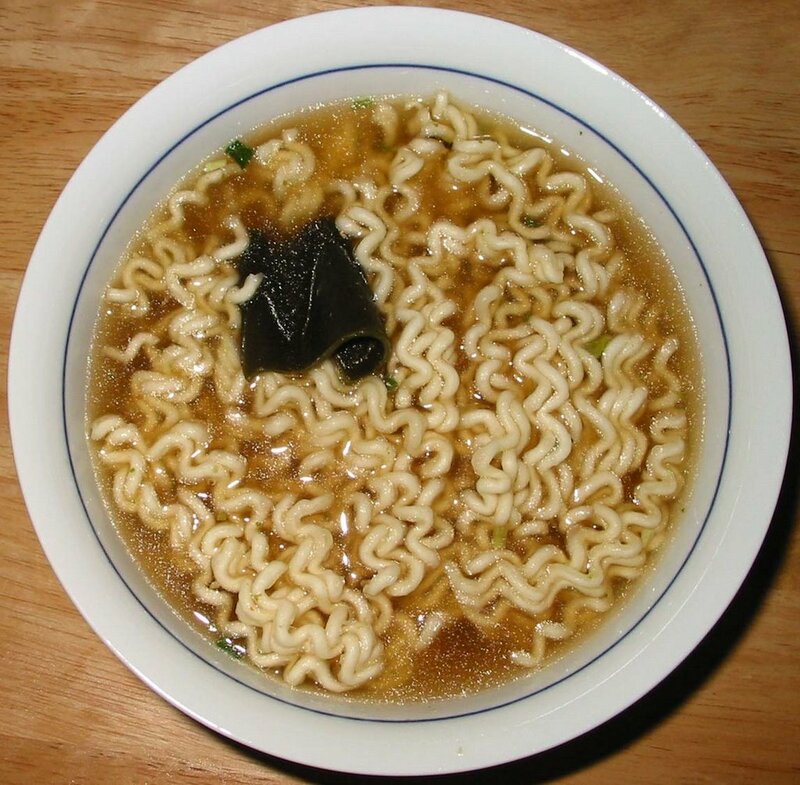 Overall, I quite liked these ramen, although my opinion of them has changed since my childhood. I wish they had a little more spice to them, either a pepper flavor or some spiciness. Now, I realize that I really should have added my Sriracha sauce to this to make it perfect, but the thought didn't occur to me at the time. I'll have to buy them again in order to do this!